Chic Runner - Photo Friday……. 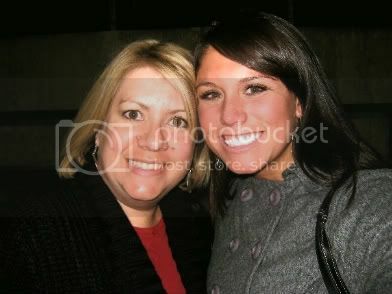 In honor of photo Friday, I’ve decided to put up some sick pictures from the football game last night, and some of one of my favorite blogger who is in the running for winning a blog award. My cousin and I after the great win that the Lancers pulled off. It was a nail biter down to the last 2 second 47 yard field goal! And now for this guy.. His name is Steve, and he is HILARIOUS! His blog highlights my day, and right now he is in the running for EverymanTri.com’s Best Sport Endurance Blog of 2008, and I think you should vote for him, because he is SO FUNNY. You can vote here, for Steve in a Speedo, or visit his blog here. Here’s how I know he’s funny. Oh possibly because he ran a whole race, and more than one for the record, DRESSED LIKE THIS! Yes, he’s the grim reaper behind those little boys!! 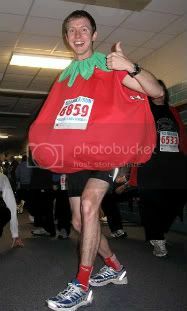 Oh wait, then he also dressed like A TOMATO for an entire race! If those aren’t funny enough, he’s really fast too! So yes, that’s my plug for him to win the endurance blog of 2008. I just think running in a costume is hilarious. So again, You can vote here for Steve in a Speedo. 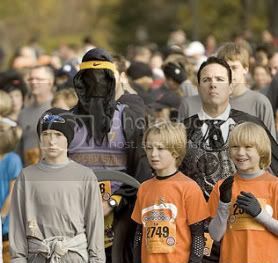 I can’t imagine EVER running in a costume.. and he’s done it numerous times. More races in costumes Steve!! !